Check out the footage below of Garcia’s big moment and his inspiring biography from the Chicago LGBT Hall of Fame. 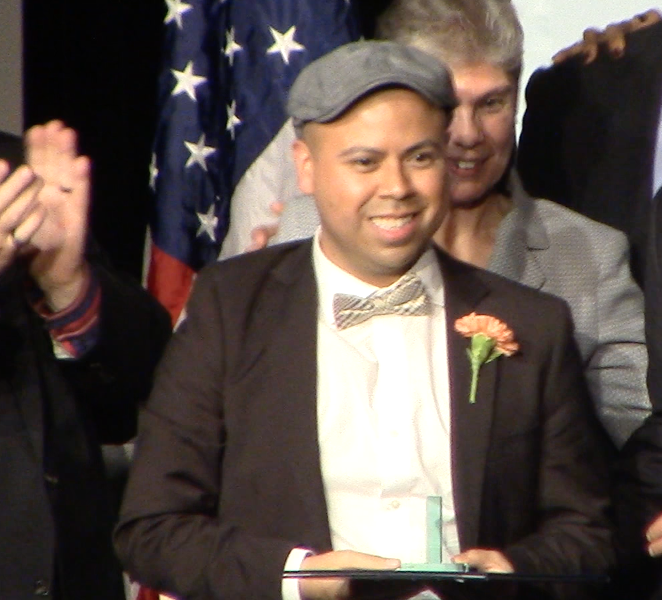 Emmanuel Garcia is a Latino LGBTQ journalist, youth mentor, and respected community leader in Chicago. He was born in Cicero in January 1982, and has spent his entire life—and the past fifteen years as an activist—in the city. In 2003, Garcia co-founded the Alvarado/Garcia scholarship for the Association of Latinos/as Motivating Action (ALMA), which for 10 years awarded two college scholarships to Latino gay, bi, queer youth. Also in that year, he began writing a column for En La Vida, a sister publication for Windy City Times. As a contributing writer for Windy City Times, Garcia focused on Latino community events and news. He has interviewed such celebrities as Paulina Rubio, Maria Conchita Alonso, La India, and Wilson Cruz, as well as three-time U.S. national figure skating champion Johnny Weir. Garcia became the producer and voice behind Homofrecuencia, Chicago’s first Spanish language LGBTQ public radio program at Radio Arte WRTE 90.5 FM in 2009. He used advocacy journalism to highlight inequalities in immigration, healthcare, and employment through a Latino queer lens. While at Radio Arte he became the lead organizer of Chicago’s largest queer youth prom at the National Museum of Mexican Art, an event that he has led for the past five years of its ten-year history. In 2010, he began to shift the focus of his activism, using his experience in print, radio, and social media to mobilize the LGBTQ Latino community. He co-organized two buses with over 100 LGBTQ Latinos to travel to Washington, DC to demand immigration reform under the name “Rainbow Riders.” Two years later, he developed and led an innovative model campaign designed to address homophobia, transphobia, and HIV/AIDS stigma within the Latino communities of Little Village and Cicero, Illinois. The project conducted focus groups among, for example, Latino parents of LGBTQ youth and transgender Latina women. As a result, a report on the needs of Trans Latina women in Chicago was published and various public forums were organized to create new community efforts aimed at better serving this vulnerable population. Also in 2012, Garcia served as a co-chair of the March on Springfield, where he brought his leadership role to the fore in organizing a bus of more than seventy-five LGBTQ youth who traveled from Chicago to Springfield to lobby for marriage equality. In 2013 Garcia created “Vives Q,” an innovative series of LGBTQ events aimed at encouraging intergenerational dialogue between LGBTQ youth and adults. This public programming highlights the contributions of LGBTQ trailblazers of color and showcases the artistic resilience of youth. Garcia has also served on the boards of the ElevArte Community Studio in Pilsen and the Crossroads Fund.